The world of modern dance is the most creative structured form of dance. It is the association of the words " creative " and " structured form " which created the major reason why dancers are confounded in trying to exact a " definition" of Modern Dance.
" The element of sophistication, and dreams are always near, and yet when acted out on the dance floor it becomes beautiful. This is the internal natural high drug of all dancers. Moreover, this natural drug is being in pure harmony with oneself, and to make it look easy at the sametime. The artistic dance montra. " Ithaca Dance Master Roger M. Christian, December 4th, 2003, Ithaca, New York. Do you have story to tell about you and modern or lyrical dance? Then goto to the below. This gift to the nation will be digitized under a joint project of the Library and AAADT, with support from the White House Millennium Council’s preservation program “Save America’s Treasures” grant. The collection will be accessible to the public at-large and to the AAADT’s staff, dancers and students through the establishment of an intranet system to serve the digitized archive. The Library of Congress will also provide on-site public access to the digitized materials, the original paper-based archive and a web site that presents highlight from the collection. Since 1958, AAADT has amassed an extensive and unique collection of archival materials relating to Ailey’s life and career, Judith Jamison’s contributions as a dancer and now artistic director and the work of the Alvin Ailey Dance Foundation. The archive also contains primary source materials on other influential artists such as Katherine Dunham, Donald McKayle, Lester Horton and Lar Lubovitch. Ailey’s personal papers, including sketches of dances, programs, costume designs, rehearsal notes, honorary degrees and correspondence with photographer Carl van Vechten. - Musical manuscripts and orchestrations, including holographic scores of works by Duke Ellington, Keith Jarrett, Leonard Bernstein, Phoebe Snow and Donald McKayle, as well as collaborative works with Katherine Dunham. - The contents of Ailey’s desk, including business correspondence, press kits, contracts and personal correspondence. - National and international news clippings containing the original pasteups from 1960-1998 and original telegrams and congratulatory notes from dignitaries and celebrities around the globe. - 8,500 black-and-white photographs representing an artistic and visual record of most of Ailey’s ballets, as well as other choreographers whose works were performed with AAADT. Some of the most notable photographers included are Jack Mitchell, Fred Fehl, Kenn Duncan, Normand Maxon, Susan Cook, Anthony Crickmay, Johan Elbers, Lois Greenfield, Jack Vartoogian and Martha Swope. - Audiotapes used for performances from 1958-1995 and 24 reels of 16mm film footage. - Some 4,000 programs of national and international performances from 1958-2004. Since 1958, AAADT has performed for more than 21 million people in 71 countries and on six continents. The Alvin Ailey Dance Foundation, Inc. is the umbrella organization that includes AAADT; Ailey II, a junior performing company of emerging young dancers; The Ailey School, founded in 1969 and offers some of the most extensive dance training programs in the world. 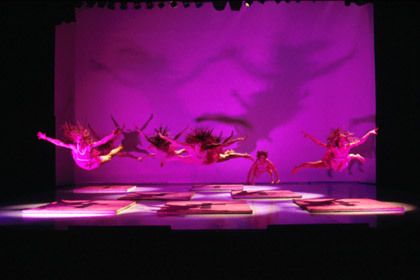 For more information, visit AAADT at www.alvinailey.org. The Ailey Archive joins the collections of such dance luminaries as Bob Fosse, Gwen Verdon, Martha Graham, Erick Hawkins, Katherine Dunham and Lester Horton. The Library of Congress is the world’s largest library with more than 130 million items in various languages, disciplines and formats. The Library of Congress serves the U.S. Congress and the nation both onsite in its 21 reading rooms on Capitol Hill and through its award-winning Web site at www.loc.gov.